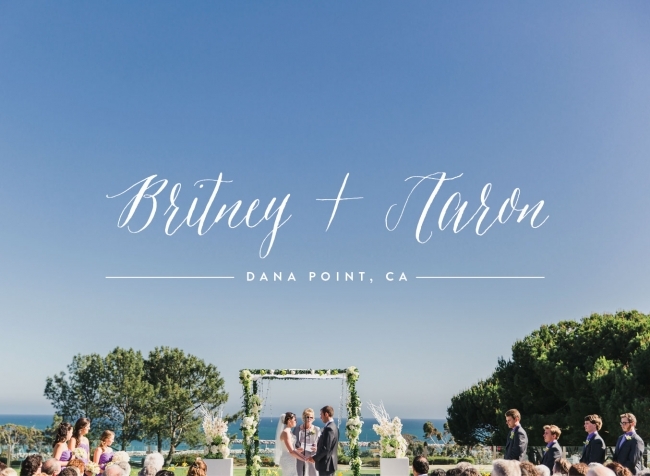 Britney and Aaron’s Laguna Cliffs Marriott wedding took place on a Tuesday, which seems a little random until you find out that their wedding day was exactly 10 years from the day that they started dating. How cute is that?! Their wedding was full of nautical references like the sailor’s knots on each of the tables (if you don’t remember, Aaron is a sailor) and a full table dedicated to have their guests leave them a “message in a bottle” for them to read on their milestone anniversaries. 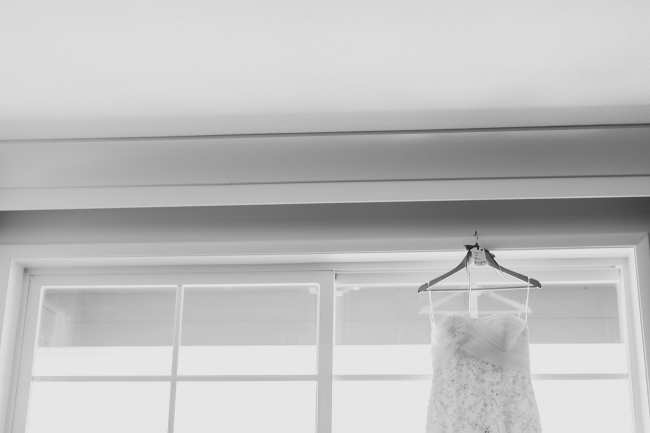 I love the details that they incorporated on their wedding day and the fact that they did everything with a big smile. I don’t think I’ve ever seen so many happy faces in one place as I did on their wedding day. I hope you enjoy just a few of my favorites from their day! Oh my goodness Britney! You are so beautiful! This was one of the cutest things EVER! Ring bearer escorts ( aka drags) the flower girl down the aisle. Flower girl refuses to go any further. So she hands the petals to guests. This next pictures is my FAVORITE! The sweetheart table was over-the-top GORGEOUS!!! Britney and Aaron’s wedding had the coolest use for some of their engagement photos that I’ve ever seen. BY FAR. These cocktails tables had their picture on two sides and then their wedding monogram on the other two. AND they lit up at night! We left their reception for 5 minutes to get a few sunset pictures…. I’m kinda obsessed with this last shot…. 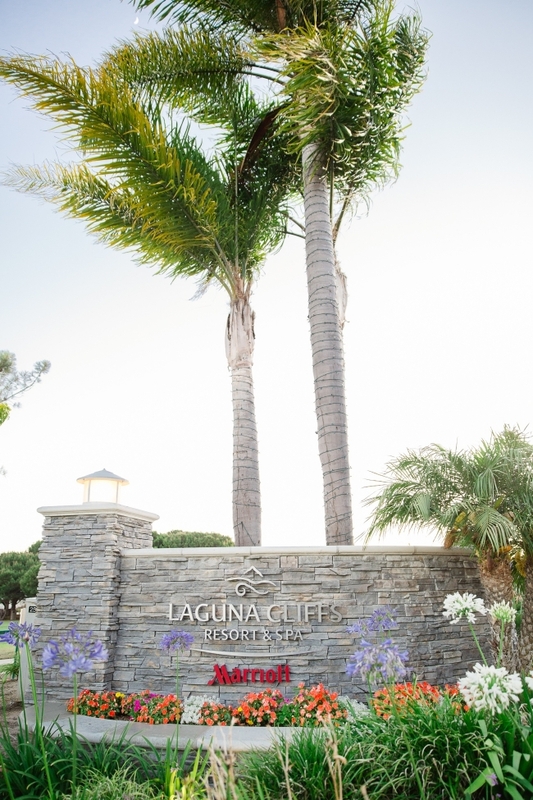 Venue: Laguna Cliffs Marriott in Dana Point, CA // Photographer: Katie Jackson Photography // Bridal Boutique: (wedding dress and bridesmaid dresses): Pebbles Bridal // Florist: Yasmine Floral Design // Wedding Planner: Monique Smith // DJ: DJ A-Dub // Cake: It’s All About the Cake // Groomsmen Attire: Joseph A Bank // Invitations: Le Paperie and Co. Huge shout out to Kristen and Lauren for helping me out on this wedding! You ladies are the best (as usual )!